All plants need nitrogen. While healthy bacteria can occur naturally in the soil, especially in fields that have grown nitrogen-fixing crops like soybeans in the past, sometimes nature requires a little help for increased production. Cool conditions in the spring cause very poor nodulation in late August. All plants need nitrogen. More importantly, soybeans need that atmospheric nitrogen made available to them because they can’t survive off of soil-available nitrogen alone. If they are forced to do so, it can result in significant yield loss. Horst Bohner, provincial soybean specialist with the Ontario Ministry of Agriculture, Food and Rural Affairs (OMAFRA), says that if producers don’t inoculate, he estimates they will see a yield loss of 10 to 15 bushels per acre, depending on the amount of soil nitrogen in the field in first-time soybean fields. In fields with a history of soybeans, Bohner has found a 1.25-bushels-per-acre yield gain to inoculating. As a result, OMAFRA recommends soybean producers invest in inoculants every year. Currah considers true virgin soybean ground a soil that hasn’t had soybeans planted in it for at least 20 years. He does admit he considers soils that have been without a soybean crop for eight-plus years at risk for nodulation failures, particularly if they are soils with higher-than-normal potential to make soil nitrogen frequently available. This can include soils with high organic matter because of a history of manure applications. Seed-placed or seed-applied inoculant insures that the soybean plants set nodules in conjunction with the reproductive stages of the crop, when the nitrogen fertility is most needed. Inoculants provide legume crops with a specific type of bacteria, known as rhizobia, which form a symbiotic relationship with the plant. It’s a win-win situation that provides the plant with the nitrogen it requires to grow and the bacteria with a safe place to live and the sugars they require for growth. As the roots grow through the soil, certain chemical signals are given off by the growing roots, which will trigger the bacteria that have been placed in the soil to infect the tiny root hairs that are being formed. Through a complex chemical conversation, the root hair will engulf the bacteria, and eventually form a nodule, which is a bump on the root that contains a population of these bacteria in the middle. A win for the bacteria! This population of bacteria then brings in nitrogen gas from the air, creating the form of nitrogen the plant needs to grow. How much inoculant a producer applies will depend on the product and factors such as if the product has an extender or if the seed is also treated with insecticide or fungicide. Bohner says there have been trials established to see if large rates of inoculant would have an impact but it didn’t provide significantly more yield. It’s best to follow the recommended rates on the product label. Currah recommends an inoculant product with a high load of rhizobia in terms of per seed unit treated. Another common question is if they should double inoculate, which is the practice of using two different products to inoculate seeds. Bohner says yes in first time fields – it’s added insurance of success. Currah says there are situations where he recommends a double-rate inoculant program that includes high-load rhizobia products that include Bacillus subtilus, additional bacteria that acts as a growth promoter. But, he says, in these instances, producers should ensure the application methods do not cause plantability issues. Whether a producer opts for dry or liquid application comes down to producer preference. The market has made a huge swing towards seed that is pre-inoculated by the seed company or seed dealer, thanks to extended-life formulations of inoculant products. OMAFRA and the University of Guelph tested pre-inoculants and found they work similar to on-farm applications in terms of efficacy. For on-farm applied inoculants, the producer has to decide if they go with liquid or dry peat products. “Each has its merits,” says Currah. “Liquids are generally applied in a spray or up an auger for mixing. This makes for even coverage but there’s the stigma of not being able to see that coverage visibly with the eye. 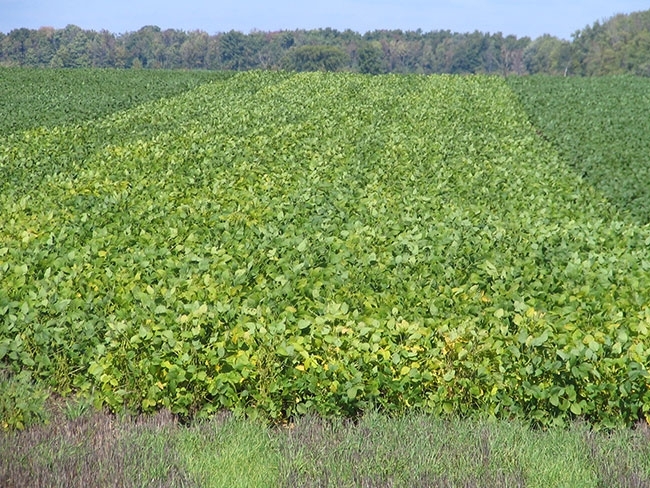 Generally, when a nodulation problem occurs in soybeans it results in a pale-green look to the crop foliage. When this occurs, a timely application of commercial nitrogen is recommended – 60 to 80 pounds of urea has worked for Currah in the past. Inoculant is a vital best management practice in soybeans. Returns are modest but very consistent at one to 1.5 bushels per acre in fields with a history of soybeans. More importantly, inoculants provide insurance against delayed nodulation or a complete nodulation failure.